Y-O-Y growth is about 95%-100% for the corresponding quarter as well as whole year. The company is having lower sales growth due to the demand from a key client being significantly impacted. The sales volume from the client stands at 40%-50% of the regular volumes. Accounts Receivable stands in the range of 60 to 70 days. The changes in the other expenditure from 25 crores to 14 crores was due to GST which started from Q2 not included in the P&L but the balance sheet. Also, there is no excise. In Q1, Excise duty was included. Operating margins for exports and imports are similar. The company is looking forward to going back to the 13%-15% margin level even after the acquisition of Omnova business. The estimated time is about 2-3 years from the acquisition. Growth is on track on all fronts ie. exports, Apcotex traditional business or acquisition and growth of that company. Initiatives taken in the form of cost cutting, sales improvement, contribution side sales margin, better customer and product mix are improving the margins throughout which is even reflected in Q2. Exports has increased in all fronts like specialties for textile non-woven, paper as well ascarpet and construction. The motive of the company is also to increase exports in the coming years. Q2 FY18 growth has been much better than Q1 FY18 since in Q1 there was a strike at Taloja plant and this affected the sales for a few months. The issue has been resolved. 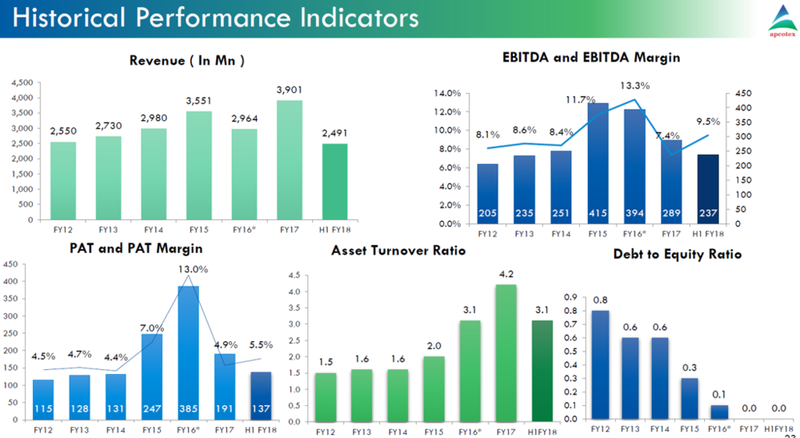 Though, the company has double digit growth in volume in first half of the year. Paper, paper board was less than half of the remaining 50% due to a key client buying only 40%-50% of regular volumes. Due to rise in demand of nitrite rubber , capacity increment is on the card.Part of 60 crores CAPEX includes replacing old equipments with new equipments increasing the capacity by 35%-40% ie. from 16,000 tonnes to 22,000 tonnes. This is expected to be completed in the next 9 to 10 months. The only constraint the company might face is funds, rest environment compliance, permissions, land are all in place. The margins have also improved due to the redevelopment of the acquired business and resolving the technical issues there and get the products approved from the customers. This cycle takes about 3 to 12 months. Hence, the NBR plant in Valia is operating at full capacity. Majority of the exports are into Middle East and South-East Asia. In addition to this, China, America, Europe and 35-40 different countries also import from the company. No significant contribution from various grades of NBR to the overall revenue but it is expected to improve in the long run. The company is well prepared to the volatility which occurs due to changing exchange rates. This has also reduced the risk due to the company’s strict hedging policy. The company is looking to achieve the target revenue of 550-600 crores this year. Though Q1 was a miss due to Taloja strike, the company has come back on track in Q2. Capacity expansion at Taloja plant is also something the company is planning in the future. This would increase the capacity for NBR and allied products and most of the Latex products. The company expects to cross 100 crores business in the exports segment in the next year, if not this year. Speciality grades in paper,carpet, construction, textiles, nonwoven fabrics introduced as new products. These grades are aligned towards exports more than domestic market. The company is in the middle of developing a completely new product soon.